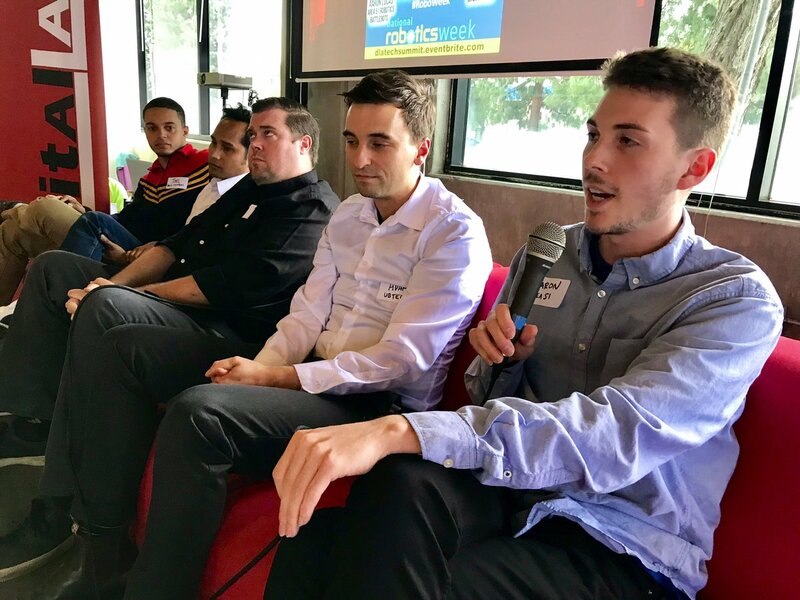 Robots are becoming less expensive with more applications in education, security, branded, and more said speakers at our Digital LA – Robots panel, our kickoff event to celebrate National Robotics Week April 6-11. 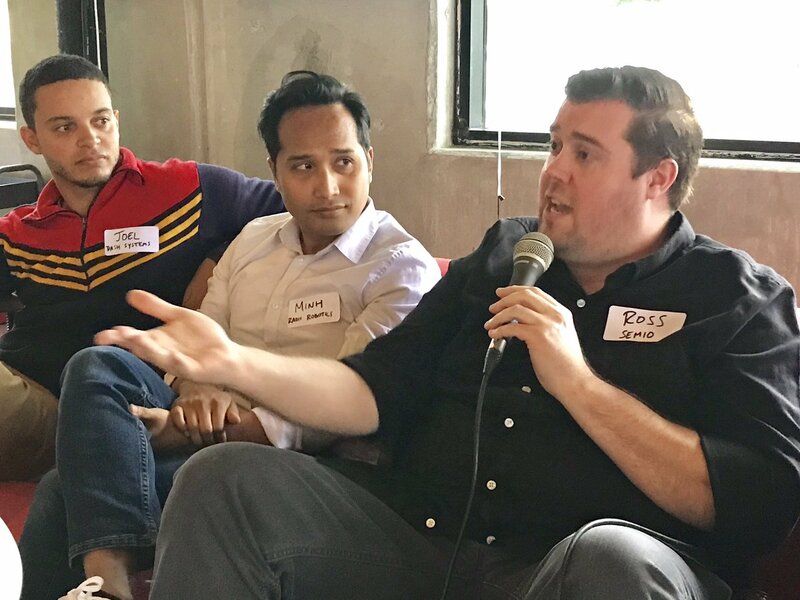 Speakers at local robots companies and startups discussed trends in robots at our panel held at Toolbox LA. 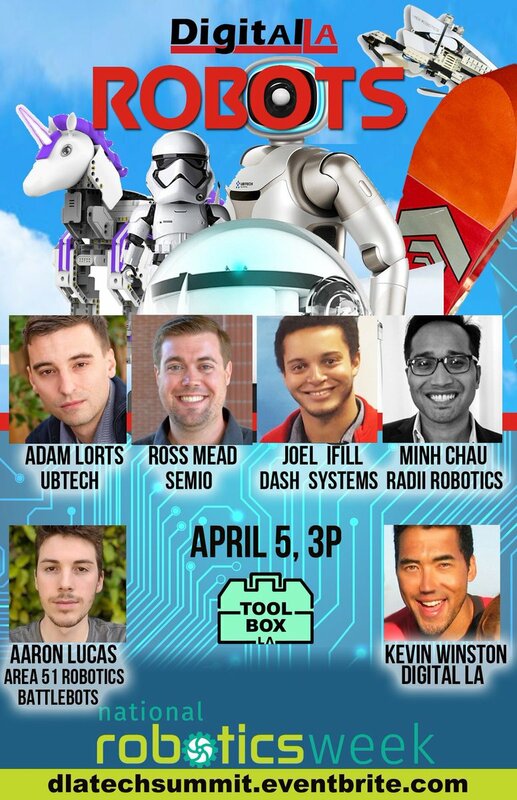 Two of the panelists DASH Systems and Radii Robotics are graduates of the Make in LA accelerator housed at Toolbox LA. 1. Multiple Uses. Robots range from children’s education to security to battle. UBTECH’s educational robot unicorn teaches girls and boys how to play and program. 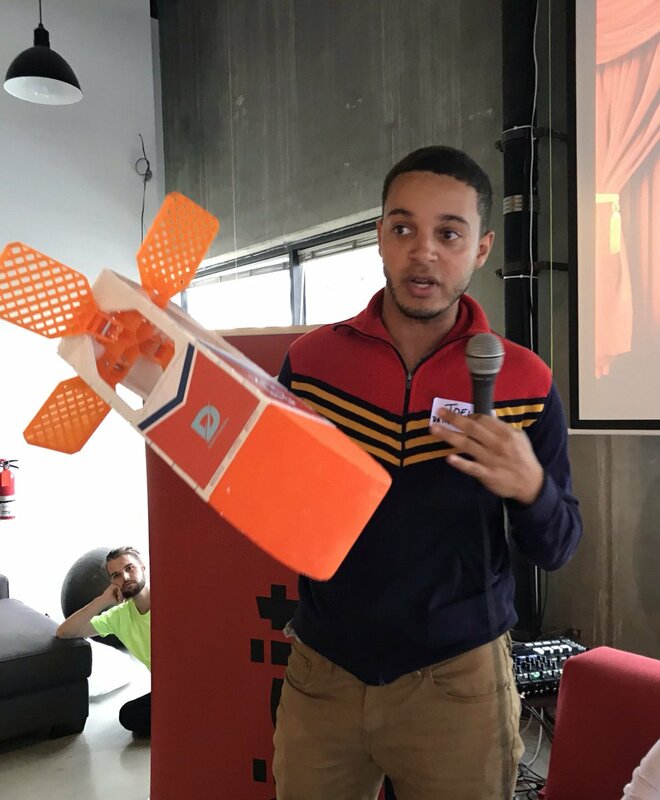 DASH Systems creates robots that are thrown out of planes to deliver aid packages to disaster areas that are difficult to reach. DASH has dropped hundreds of disaster relief packages in hurricane zones, said Joel Ifill, of DASH Systems. Battlebots robots fight each other with high-tech weapons on TV. Robot companions for senior living and health, like Baymax from Big Hero 6, are on their way. UBTECH’s philosophy is for a “robot in every home” said Adam of UBTECH Robotics, with offices in downtown LA. 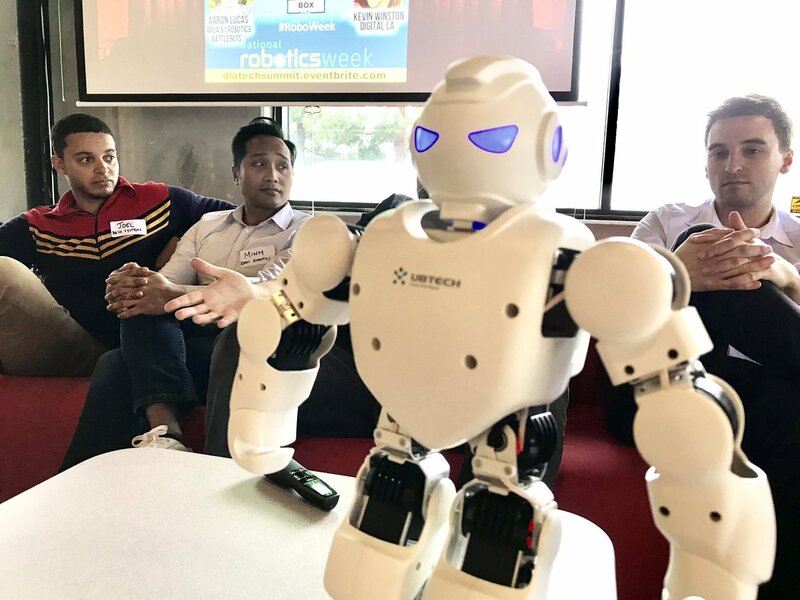 UBTECH also wants to provide robots for your entire life stage, from children’s education robots, to adult security or customer service concierge robots, to senior health care / companion robots. 2. Less Expensive. Robots are becoming less expensive to create and produce. What used to cost a few thousand dollars a few years ago can be made with a few hundred. Less expensive robots opens up new consumer markets, with robots under $200, which seems to be the current price point for consumer robots. 3. More Consumer. While B2B has been using robots for automating on the back end for years, more B2C consumer robots are arriving on the market, thank to decreased costs. 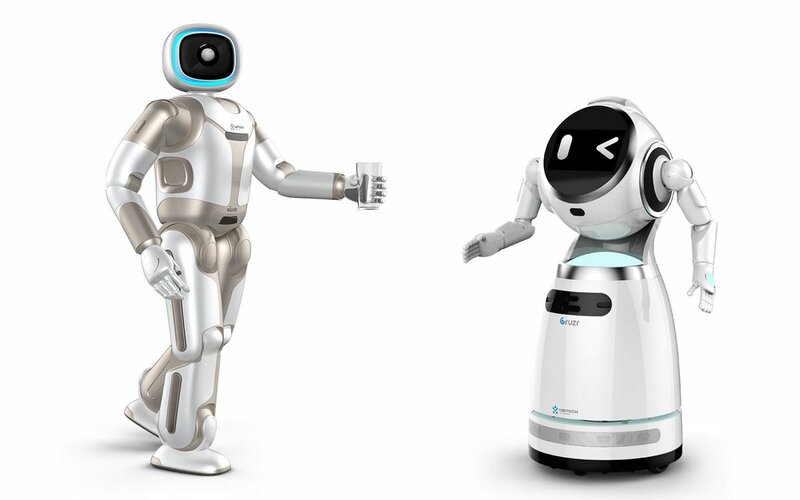 UBTECH and several other robots had increased presence at CES in Las Vegas this past year. 4. More Branded. Robots are partnering with Hollywood brands to created branded IP robots. 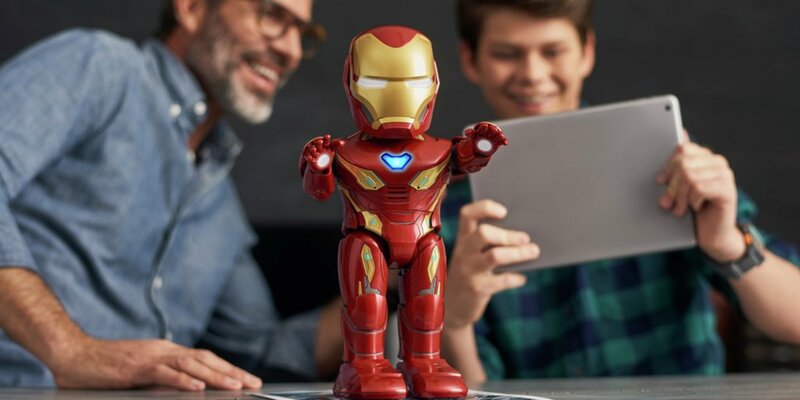 UBTECH released an Iron Man MK50 robot on the same day as our panel, at an event with Robert Downey Junior and the cast of the Avengers at Disney California Adventure. Disney has partnered with other LA based companies to make branded robots, including Ozobot for education robots, and Disney Accelerator alum Sphero with its breakthrough sellout BB-8, and later Lightning McQueen and R2-D2 toys. 5. Robot Apps and Software. The personal robotics industry is in the tinker stage, much like the early days of personal computing. This means there aren’t wide standards yet for robot programming languages or operating systems. Many robot programmers use Robot Operating System (ROS), which is comparable to Linux or MS-DOS right now; however, there is currently no user-friendly, cross-platform standard for robots like Windows is for desktops and Android is for smart devices. 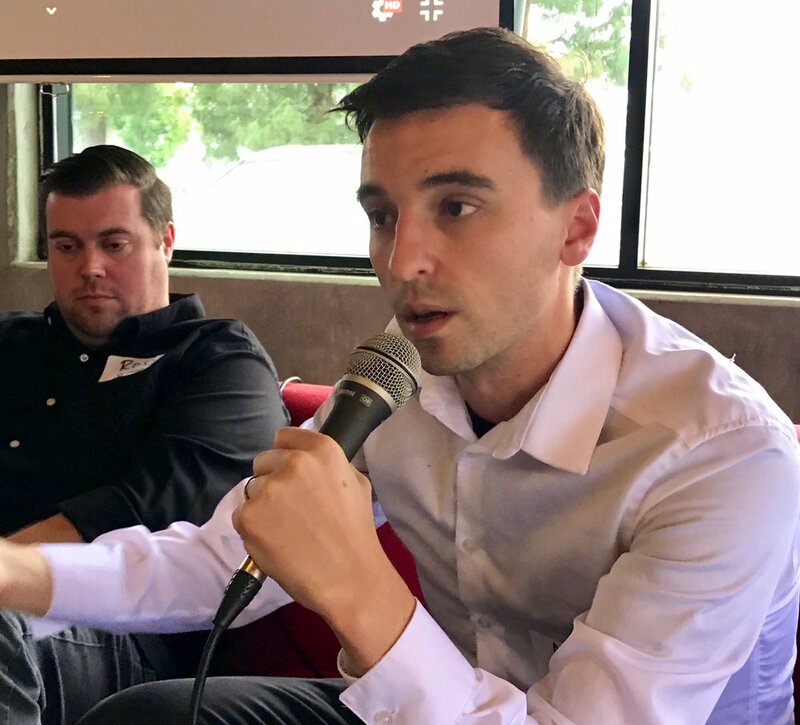 Ross Mead’s company, Semio, is addressing this by developing an operating system, app ecosystem, and app developer tools that makes it easier for robot app developers to write dialog scripts and build expressive animations for interactive personal robots that will be part of our everyday lives. Jimu Unicornbot educational robot teaches kids to play and program. Cruzr customer service robots have voice recognition, speech, and mobility to greet you at offices or airports. You can ask it for directions, and it can lead you to the right direction. Walker robot is 5′ tall and can actually walk and assist you with functions, like taking your umbrella, opening a bottle, and more. They are in beta form now. They will be released for senior care, or household assistance, like Rosie from the Jetsons. – Dr. Ross Mead, Semio, CEO and Founder. 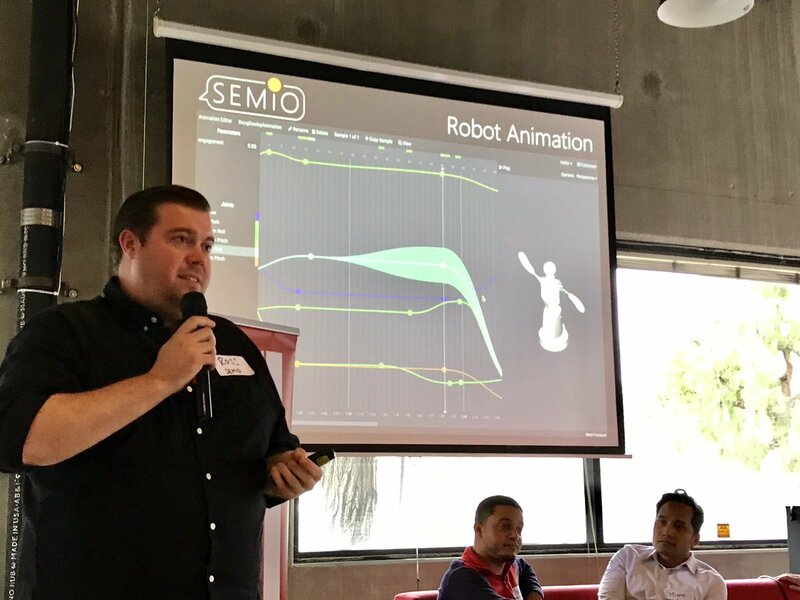 Semio is an LA-based software startup that enables robot developers to rapidly create and deploy robot apps, and allows robot end-users to access and use those robot apps. The Semio operating system relies on natural language user interfaces, such as speech and body language, to bring robots to life. – Minh Chau, Radii Robotics, CEO and Founder. Radii Robotics usesspatial AI to pioneer the development of an aerial robotics platform thatcombines drone mobility with human dexterity to replace manual labor performed at high altitudes. – Aaron Lucas, Area 51 Robotics, CEO/Founder. 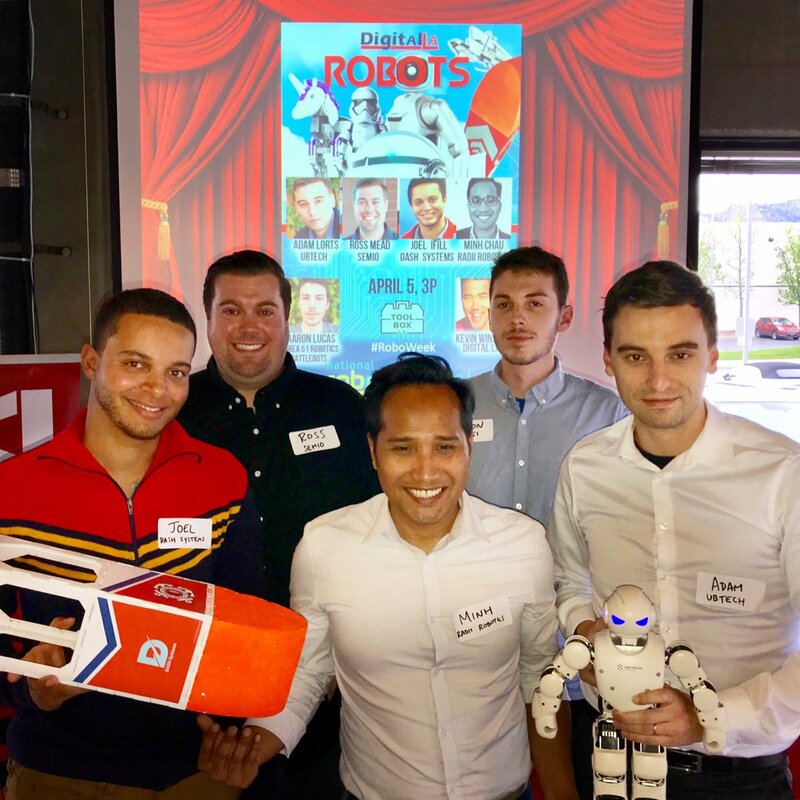 Area 51 Robotics is a new startup that provide robotics education classes. 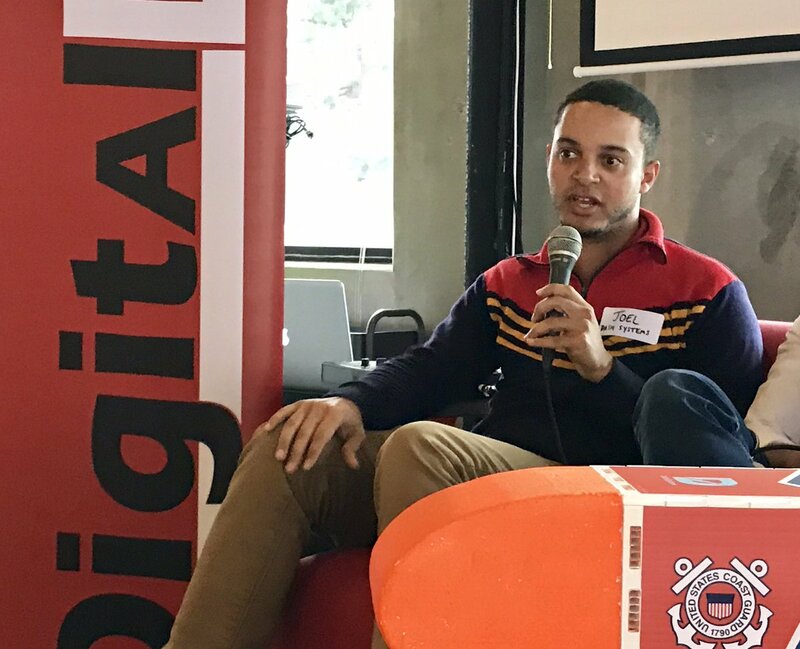 Aaron Lucas teaches courses in robotics at middle schools, where students learn to create robots that perform simple tasks like picking up objects. The students can then compete in a school league. Aaron himself also creates robots that battle with weapons in a competition league. His team is creating a robot with a helicopter like blade that goes at 150 mph, which will compete in the Battlebots competition in Long Beach this month. Thanks Toolbox LA for hosting our event!